Nearly 150 years ago, a pious Brahmin named Kshudiram Chattopadhyaya lived there(Kamarpukur). He was poor, but honest and devoted to God. He was greatly respected by the villagers for his austere life, truthfulness and kind treatment of others. His wife, Chandramani, too was very simple and virtuous. She was devoted to the gods and goddesses, and was fond of serving all who came to her house. She would not let anyone go without offering something to eat. Earlier, Kshudiram had lived in another village called Derepur. The rich zamindar there once wanted Kshudiram to tell lies in the court to support him in a suit against a neighbour. Kshudiram refused to do so. In revenge, the Zemindar grabbed all his land and property. 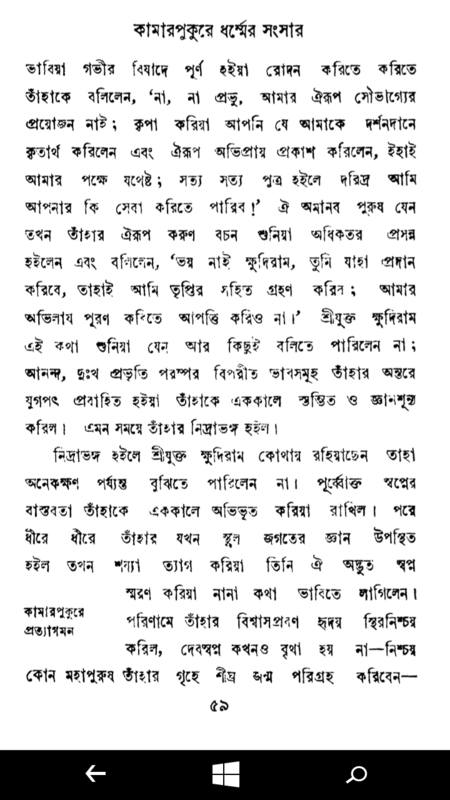 Thus Kshudiram had to leave Derepur and settle down in Kamarpukur. Once, while walking to another village, Kshudiram fell asleep on the wayside. He then dreamt that Shri Rama appeared before him and said: ‘Look, Kshudiram, I am lying in yonder field uncared for. Please take me home and serve me.’ Kshudiram replied: ‘Lord, I am a poor man. How can I serve you?’ ‘You needn’t be afraid, Kshudiram. I shall accept whatever you give,’ said the Lord. Kshudiram woke up and, to his surprise, found near by a Shalagrama stone, a symbol of Shri Rama. He took it home. Calling it Raghuvir, he set it up in his house and began the daily worship of it. Chandramani was most happy about the arrival of Raghuvir in their house. She joined her husband in the worship. To the present day, the worship has continued. ​Though Kshudiram and Chandramani were poor, days passed joyfully in their new home at Kamarpukur. They had two sons, Ramkumar and Rameshwar, and a daughter, Katyayani. When Kshudiram returned from Gaya, Chandra told him about the vision. He consoled her and said: ‘Don’t worry, but don’t speak about it to others. I too had a vision at Gaya. A wonderful child will be born to us.’​​We read in the Bhagavata that when Sri Krishna was in the womb of Devaki she became like a goddess herself. Her beauty seemed to fill the prison cell with light. At the time when Krishna was born she saw many gods too. When Sri Ramakrishna was in her womb Chandra Devi too became very beautiful, she too could see so many gods. God was coming to her as her son; so she looked upon and loved not only all men but the gods as well, as her own children. One day when the sun was very hot a god came to her riding on the back of a swan. His face was red. He was Brahma. Chandra Devi had not read the scriptures; so how would she know that the god was Brahma? How would she know that Brahma’s complexion is red? She thought that his face was red from sunburn. So most affectionately she called to him and said: “Dear little god riding on your swan, your face looks burned by the sun. There is some cool rice in the house; do come, eat a little and refresh yourself before you go on.” Brahma heard what she said and then smiled and disappeared. Since Chandra Devi loved everyone as her own son, when everybody in the house had eaten, and before she ate her own meal, she went out to see if anyone in the neighbourhood was going hungry. If she found such a person Chandra Devi would bring him to her house and give her own food to him.Months passed. The autumn and the winter were gone. It was spring, 1836. Trees were putting forth new leaves and blossoms. The kokil and other birds were singing. Chandramani was attending to the daily worship of Raghuvir as usual. But that day, the 17th February 1836, she felt different. She felt the new baby would be born very soon. And in the early hours of tne next day, a beautiful child was born to her in the thatched shed where the husking machine and a small oven were kept. Dhani, the midwife, was there to help. A few minutes after the child was born, he was not to be seen. Where was he? ‘Oh, my goodness!’ she exclaimed, ‘here he is rolling in the ashes in the oven. And he is not even crying!’ She took an earthen lamp in her hand and looked at the child and thought: ‘O my! He is so big and chubby, like a six-month old child!’ The joy of Chandra and Kshudiram knew no bounds. They felt that the Lord had fulfilled His promise. Kshudiram, remembering his dream at Gaya, named the boy ‘Gadadhar’, the name of the Lord at the Vishnu temple there.It was spring. The trees in Kamarpukur had put forth new leaves. Flowers were blooming. Birds were singing. The gentle south wind soothed the body and the mind. ​​But what is the source of the above story? The source of the story is the 1st chapter (Purva Katha O Ballojivan) of the book RAmakrisna LilA Prasange, which is considered as a comprehensive biography of Sri RAmakrishna Paramhamsa. It was composed by Swami Saradananda, a direct disciple of Sri RAmakrishna. Not the answer you're looking for? Browse other questions tagged vishnu avatars ramakrishna .